If you would like to learn more about the Civil War, check out the web sites for the following topics! 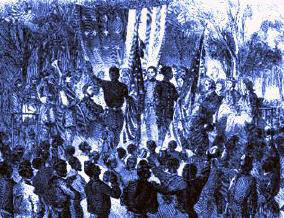 Freedmen And Southern Society Project. Virginia, from August 2 to 5, 1865. Read the report of the Joint Comittee on Reconstruction, given on June 20, 1866. Lincoln's Assassination A drawing which depicts Abraham Lincoln's assassination. An excellent site created by a former history teacher. Washington Personality: John Wilkes Booth. A biography of Abraham Lincoln's assassin. General Henry L. Burnett's memories of the Lincoln assassination trial. A site created by the Library of Congress regarding the Lincoln assassination. The White House: Abraham Lincoln. The official Lincoln page from The White House web site. Abraham Lincoln: The Man and His Hour. controversial view of the sixteenth President. The impeachment of Andrew Johnson President Andrew Johnson. An excellent site created by Harper's Weekly. A site created by IntellectualCapital.com. Internet Public Library Biography of Andrew Johnson. Andrew Johnson's Obituary from The New York Times. "Andrew Who? : The Clinton Scandal from the Perspective of the Impeachment of Andrew Johnson." A paper presented at SUNY-Plattsburgh.